Football Outsiders hasn't yet released their Adjusted Games Lost metric, which will document how affected each team was by injuries in 2012. 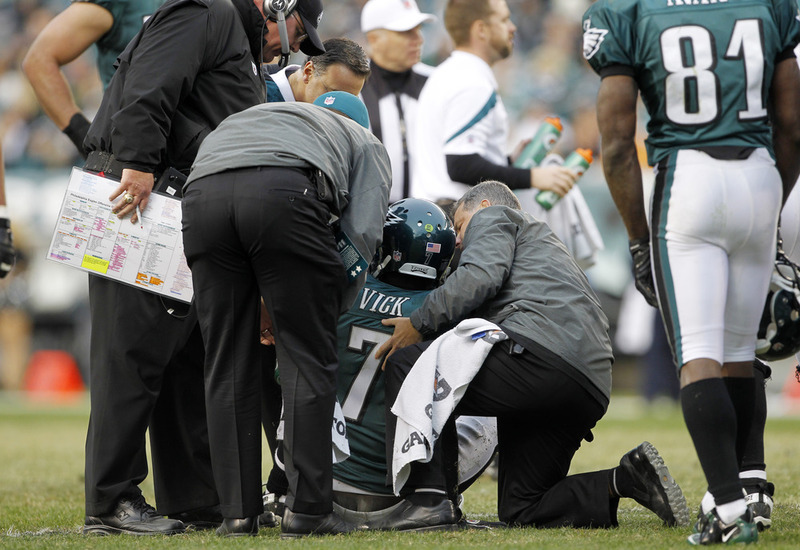 In 2011, if you recall, the Eagles placed second among all teams with only 22 "games lost" by players due to injury. That low figure suggested that the team's disappointing season couldn't be excused by bad luck, and that there was little upside in terms of a regression to the mean. The disastrous 2012 campaign showed the truth of that hypothesis. Although the full metric isn't out yet, we can already see a mixed bag with regard to injuries from last season. I went through and pulled a rough estimate for 2012 of the "games lost" by players because they were on the trainer's table and came up with 65. That would have placed the Eagles near the middle of the league overall. However, there's a massive split comparing offense to defense. On the Eagles defense, few starters missed games due to injury. Trent Cole missed one, as did Mychal Kendricks and Fletcher Cox. But overall it was a remarkably healthy group. That's not a good thing when you're projecting for 2013. It would be nice to say "If only Nnamdi Asomugha and DeMeco Ryans and Cullen Jenkins were healthy, then things would have gone better." Instead, this was the best performance the Eagles defense could muster, despite staying relatively healthy. Don't expect a lucky bounce back next season. The offense is a different story, though. I counted about 60 games missed by starters on offense. Key skill players each missed a handful: Michael Vick, LeSean McCoy, DeSean Jackson. Jason Avant, Brent Celek, and Jeremy Maclin also had a few. All together, that figure would have been right near the top of the league in 2011. But more amazing is the 40 games missed by the offensive line, including 30 just by Jason Peters and Jason Kelce alone. That's a staggering figure that is unlikely to be repeated in 2013. As I said earlier in the week, the offense has a chance to make a quick recovery if players like Peters and Kelce return to form and the unit avoids the injury bug this year. There's your optimistic note going forward. I wish I could say the same about the defense. Tagged with Injury, Jason Kelce, NFL, Philadelphia Eagles, Defense, Jason Peters, Offense, Football Outsiders. January 25, 2013 by Brian Solomon.